Celebrities attach their name to multiple products such as; perfumes, aftershaves, clothing ranges, drinks and even video games. In fact there is a history of celebrities either the main focus or cameo roles in games. Not all celebrity video games are bad but more often than they result in; hasty, glitchy or incomplete titles that serve as cash-ins. This week’s Four of a Kind showcases four celebrity endorsed retro video games to be avoided. Chuck Norris: actor, martial artist, producer and internet meme legend. In 1983 he endorsed the game Superkicks, produced by Xonox, wherein players controlled Chuck rescuing a hostage via moving through maps and fighting enemies. Visually the game is awful, even by Atari standards, as it is hard to distinguish character renderings. Essentially they are slightly improved upon stick figures. The main, worst aspect of the game is the controls. 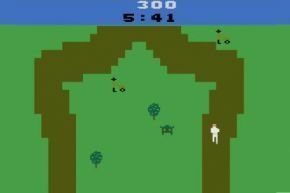 Despite Atari 2600 controller only having one button the configuration was oddly difficult due to having to hold down the button and move the joystick side to side in order to make Chuck kick. Unanimously labelled as ‘the worst video game ever’ is harsh. Shaq Fu is terrible but has enough redeeming, straw-clutching qualities though not enough to avoid this list. The plot of Shaq Fu is strange but imaginative; on the way to a charity basketball game, in Japan, Shaq visits a Dojo to speak to a martial arts master named Leotsu. After the conversation Shaq is transported to an alternate dimension where he must rescue Nezu, a young boy capture by an evil mummy Sett Ra. No, seriously. Shaq Fu is a 2D fighting game with decent graphics but the gameplay is tedious. The control scheme is awkward, unresponsive and tiresome. Also given Shaq endorsed this game it is peculiar that he is the weakest fighter. Shaq was not the only basketball star endorsing video games in the 90s. In 1995 EA and Michael ‘Air’ Jordan formed a partnership to release Michael Jordan: Chaos in the Windy City. The game’s plot is as inspired as Shaq Fu but, at least, incorporates more of Jordan’s basketball fame. Before the Scottie Pippen charity game, Jordan's teammates are abducted by aliens so he sets out to rescue them before it’s too late. Released in 1995 William Shatner’s TekWar is a first-person shooter that is interesting, but equally bad, for numerous reasons. Firstly it derives from the series of TekWar novels, created by Shatner, which also spawned; a tv programme, tv films and comicbooks. Secondly the game uses the Build engine, a staple of first-person shooters and famed for other titles such as Duke Nukem 3D. Lastly cutscenes are cinematic, featuring Shatner reprising his role as Walter Bascom, and differ depending on outcomes. Despite all of this TekWar is mediocre and does not offer anything exciting or new. Missions quickly become repetitive, graphics are blocky, animations are jarred and Shatner’s instructions are uninformative resulting in players feeling lost. The premise is the only positive but does not engage players’ attention enough to explore its own appealing tropes or accomplish much. That ends this week’s Four of a Kind. As always leave a comment to discuss the games included or mention games that have been omitted. Honourable Mentions: Make My Video series (Sega Mega-CD), Kiss: Psycho Circus: The Nightmare Child (PC, Dreamcast), The Wacky World of Miniature Golf with Eugene Levy (Phillips CD-i), Prince Interactive (MAC), Spice World (Playstation).